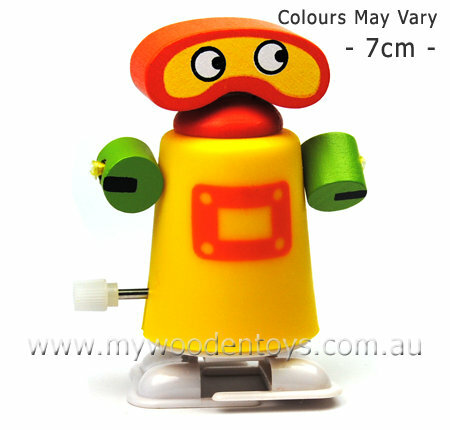 Wooden Wind Up Clockwork Robot is a sweet colourful little clockwork robot with a wooden head and arms. This robot has a well made plastic body housing the clockwork motor. The arms are threaded through the body on elastic. This is a lovely little toy and combines wood, plastic and clockwork in clever way creating a really fun toy. Size: 7cm tall 5cm wide. Material: Wood, plastic, clockwork motor. We like this because: "A robot wind up... What more can you ask!"